Special Amenities: - Air Conditioning - Heated Pool and Spa - Automatic Pool Cover - Blazing Fast Internet 100Mbps - Five Bedrooms - Five Bathrooms - Fifth bedroom is the detached Guest House with Queen Bedroom, Living Room with sofa, lounge chairs and a big screen TV, plus a full bathroom with walk in shower, a Kitchenette with two burner stove, and a mini fridge - 4 Bicycles - Walking distance to lower village shops, cafe's and restaurants - Walking distance to beach - Sonos Wireless Speaker to stream your playlist. Casa Alegria, is a newly remodeled home with a detached guest house. This home is in the PERFECT location. Walk to butterfly beach or the lower village of Montecito where you will find great boutiques, cute dining spots, coffee shops and tons more. As you and your guest enter into the new courtyard, be welcomed into a serene and beautiful setting where you are invited to sit and relax around the outdoor lounge furniture and the bistro table and chair with the relaxing sounds of the imported Moroccan fountain. Enter inside into a bright and colorful family room with a gas fireplace and a 65-inch flat screen TV. Enjoy the High-Speed WiFi access and Sonos Sound System through out the home. The rear doors open onto the back patio living space which includes chaise lounges, umbrellas, patio heater, multiple lounging areas and a dining area with a gas grill and an umbrella. The backyard has nice grassy space offering great entertainment opportunities. Enjoy 6 lounges on the outside deck area by the cabana along with a generous dining area for 8 guests. Dining inside Casa Alegria is less formal and seats up to 8 guests who will enjoy the warmth of a second gas fireplace while eating and conversing. Inside the open kitchen you will find all the modern conveniences one would need to cook a gourmet meal. Master Suite: The bright master bedroom has a king size bed, Ceiling fan, 55-Inch flat screen TV with DVD, sofa, great closet space, and separately zoned Air Conditioning. The ensuite master bathroom has tile floors, a walk in shower and a soaking tub. The master suite has it's own private exit to the backyard patio and pool area. Bedroom Two featuring a King bed and a 40-inch TV. This room also has an area with a chair. The ensuite bathroom has a shower. This room also features a private exit out to the backyard patio and pool area. Bedroom three has a queen bed, a large seating area with club chair and a window seat. The bathroom adjacent to this bedroom has a walk in shower. Bedroom four has two twin beds, closet, and an ensuite bathroom with a shower. Bedroom #5 is the detached guest casita with a Queen Bedroom and it's own entrance directly into the bedroom. The bedroom can also access the casita which is very spacious. The living area has a 65-Inch flat screen TV with full cable and Blue Ray/DVD, a mini bar, two burner stove top and fully equipped kitchen. The casita bathroom has a walk in shower. The Casita has French doors that open to the pool area. This is the perfect gathering area to watch the game and enjoy the wonderful Santa Barbara weather while lounging at the pool. The casita also features a WiFi connection so you can stay connected while at the pool. There is a parking for 4 cars. Two cars in front of the home and two on the side of the house. 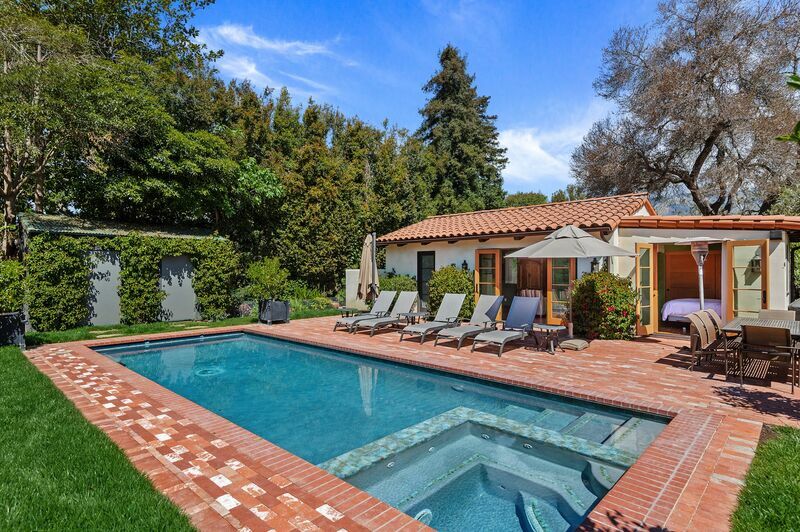 This is the perfect home to enjoy casual living in a great Montecito location! Location: Prime Montecito Location – Walk to Coast Village Road. Walk to Butterfly Beach and the Biltmore Resort. A memorable and comfortable stay at Casa Alegria. You'll find shopping, cafes, restaurants, spas, and yoga studios within walking or cycling distance. This luxurious home is packed with every amenity like bikes and a wonderful pool and hot tub as well as several outdoor living spaces making it fun for a family vacation or a getaway with close friends! This house has something for every age and any kind of vacation - whether you're a homebody or enjoy the outdoors. We look forward to coming back soon! Friends and family joined us to celebrate our daughters graduation from UCSB. Everyone enjoyed the home and the convenience of everything. The home was well stocked and the bedrooms were very comfortable. Casa Allegria has everything you could want in a Vacation home. Hope to visit again! The property was perfect!! We would definitely like to come back and stay again. We were there for my daughter's wedding in Santa Barbara and the home was large enough to sleep our whole family--and it had such a lovely outdoor living area! We enjoyed sitting by the fire pit in the evening. Kevin was great--and very responsive to questions. Thank you! My family and I had an amazing stay at Casa Allegria. The house was in beautiful shape and perfect for our needs. The kitchen was well stocked with what we needed for cooking. The kids fully enjoyed the pool and pool house. Kevin was a pleasure to work with and so quick to respond to any and all of our needs. We hope to visit Santa Barbara again and will definitely recommend SBER! We have thoroughly enjoyed being here as "snowbirds" away from Chicago this winter. Casa Allegria has been the perfect set up for our needs between the owner's sense of home comfort & design as well as SBER's attention and management. When just settling in, Property Services Manager, Kevin was very helpful in explaining systems of the house (cable, DVD, pool, wifi, etc) With regard to our few questions or concerns he was prompt in responding and finding solutions. And he gave us good tips to orient us to the Montecito area. Everyone who came to visit admired the home, furnishings, interesting art, books, cabana and garden. Landscaping and pool services were kept up according to schedule. It's such a comfortable place. We and our overnight guests found the beds terrific as well as bedding and towels luxurious. The kitchen equipment supplied whatever was needed for meal preparations-and we like to cook. Household basics were well planned for convenience & simple upkeep. Family living in LA came up to visit most weekends. Our 3 and 5 year old grandchildren were pleased with their room with separate little dressers and happy to be near their parents in the guest suite. My husband, an avid cyclist, found the bikes supplied at the house as very good and of course Santa Barbara is a great place to bike. The houses location between Upper and Lower Villages of Montecito is very convenient to shopping and restaurants. We found the YMCA and public library to be great resources as well. The owner's little books on hiking in the foothills and beach walks came in handy. In all, we are most appreciate to Donna Hartman and the SBER team for facilitating our plans and assisting in our wonderful stay. Thank you! My family spent a wonderful July 4th week together at Casa Allegra. It's a lovely house with lots of outdoor spaces for sunning, reading, swimming and even roasting s'mores over the firepit. We had beautiful family dinners at the outdoor dining table. It's an easy walk to town and the beach. We hope to go back and have another wonderful family visit at this lovely and relaxing home. Great owner, great management company and great maintenance people. Housekeepers were also wonderful… Great house and excellent fit for us. We would stay there again. We were booked to stay at a local hotel in Montecito, but switched to this beautiful home when it came available at the last minute. The differences of staying in a home vs a hotel are huge. This home is perfect for one or two couples and would be even better for larger families or groups of friends. We were so glad to have had a fully equipped kitchen, beautiful back yard with a pool and hot tub, plus a fire pit in the front yard. There are even bikes to enjoy a cycle around the neighborhood. But best of all were the amazing beds, luxurious bedding and really comfortable mattresses, with none of those strange hotel noises to wake you in the middle of the night. The bedrooms are separate and very private, but the communal areas make it great for larger groups. Very, very nice !! Everything was perfect. Spencer made the reservation process easy and enjoyable and Kevin was there to let us in and show us everything we needed to know about the house. He responded quickly to our questions and the overall experience was a pleasure. We will definitely rent with you again. Thank you.